Solar-powered station includes transmitter and battery inside weather-resistant shelter. Sensors are sold separately, letting you build the station that matches your needs. 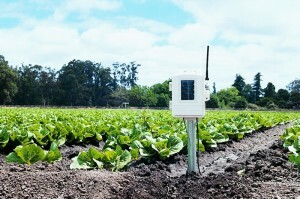 Each wireless Vantage Connect can receive data from a single Wireless Leaf & Soil Moisture/Temperature Station. See also the Complete Soil Moisture/Temperature Station (6345CS) which includes 4 soil moisture sensors and 4 temperature probes.